The Chuck Jones Center for Creativity applied for and was accepted as one of 10 non-profit organizations to participate in the 2017 UCLA Social Enterprise Academy.Established 15 years ago, SEA works with non-profits from around southern California, to help them develop social enterprises that will help fund them and their prorgrams now and into the foreseeable future. It pairs five 3rd and 4th year Economics students with the non-profit. The Center is working with a dynamic group of young people. They came down to make a site visit a few weeks ago and our lead teaching artist, Denise Dion-Scoyni put them through a rigorous series of creative exercises. Their "genius" got a good work-out! The class meets once-a-week and the non-profits meet with them at UCLA every other week. By the end of May, the students and their non-profits will make a presentation to angel investors and the winning non-profits will split a considerable monetary prize to help them jump start their social enterprise.. The best part though, is that every non-profit leaves the Academy with a viable social enterprise that includes a business plan and a marketing plan. 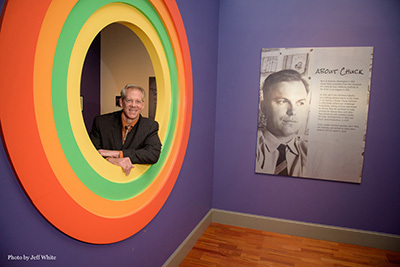 This week, Craig Kausen, chairman of the Board, presented the Center's students with the work of art they had collaborated on during their visit to the Center. It's hidden aspect revealed! Chuck Jones Center for Creativity Art Student, Jamie Martin, in the Spotlight! Inspire Charter School featured one of their high school students, Jamie Martin, in their January newsletter. Jamie's one of the Center's most talented up-and-coming young artists and has been nurtured by our lead teaching artist, Denise Dion-Scoyni, for the past couple of years. For more information about private art lessons at the Center, please contact our program manager, Cyndi Burgess, at Cyndi@ChuckJonesCenter.org or by calling 949-660-7793. Looney Tunes characters are copyright Warner Bros. Entertainment, Inc.
Lots of Creativity Options this Weekend! 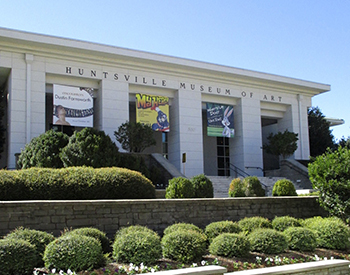 The Chuck Jones Center for Creativity is offering a weekend full of creativity! Saturday morning at the Center will be Drop In & Draw from 9:30 AM to noon; it's free and open to the public. The Center will be at the Newport Beach Civic Center from 10 AM to 4 PM for "Art in the Park" with several different creativity stations in play. 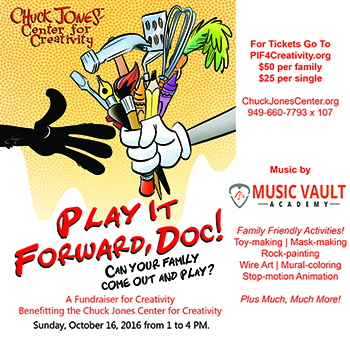 Sunday, October 16: Please join us for PLAY IT FORWARD, a FUNdraiser for Creativity from 1 to 4 PM. 10 creativity stations will be swinging all afternoon long. Make a halloween mask, make a toy, color, animate, make a musical instrument, write song lyrics, do voice over work at a Foley Station, plus much, much more, including a fabulous Silent Auction! Tickets are available at PIF4Creativity.org. "Chuck Talk" with Phil Roman and Linda Jones Clough, moderated by Bill Kroyer, head of the Digital Arts Program at Lawrence and Christina Dodge College of Film and Media Arts at Chapman University. 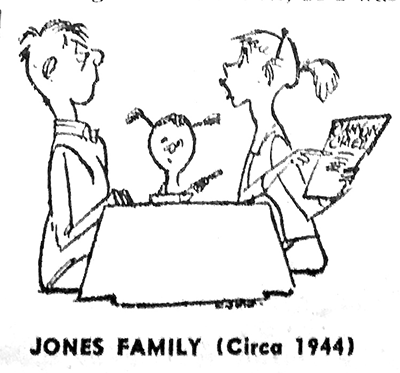 Phil Roman, legendary founder of Film Roman, worked with Chuck Jones in the 1960s and 1970s. Linda Jones Clough is not only Chuck's daughter, but also an Emmy Award-winning producer. 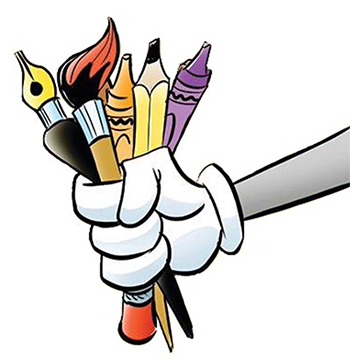 The conversation will center around their experiences with Chuck Jones, creativity, drawing versus digital modeling and the importance of story and acting in animation.September 14, 2017 from 7 to 8:30 PM at the Digital Media Arts Theater, Chapman University, 200 N. Cypress St., Orange. CA. Space is limited! RSVP at 949-660-7791 x 22103 or to Robert@ChuckJonesCenter.org.